Be amongst the first to get acquainted or re-acquainted with famous local artist Vida Lahey as she makes a fine return to Brisbane’s streets and art galleries. You will learn about Vida’s passionate advocacy for Brisbane’s art and cultural scene, her great friendship with the incredible sculptor Daphne Mayo, and her own personal journey. This tour begins at Brisbane City Hall and concludes within the Queensland Art Gallery. Vida will showcase sites that she painted around Brisbane in her quest to capture the growing and vibrant cultural city metropolis. She will also proudly highlight the numerous works of her friend, Daphne Mayo who is celebrated as one of Australia’s finest sculptors. The various, changing locations of Brisbane’s public art gallery will be revealed, along with the many private art galleries that supported a wealth of Brisbane artistic talent. 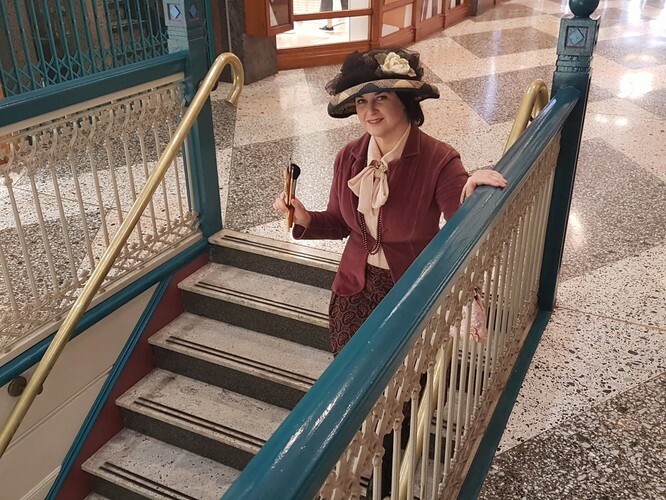 This is an immersive 2-hour theatrical walking tour experience, so prepare for some delightfully entertaining surprises as you connect to Brisbane through Vida in such a unique and special way.